Friday Oct 13th was a good day this year. 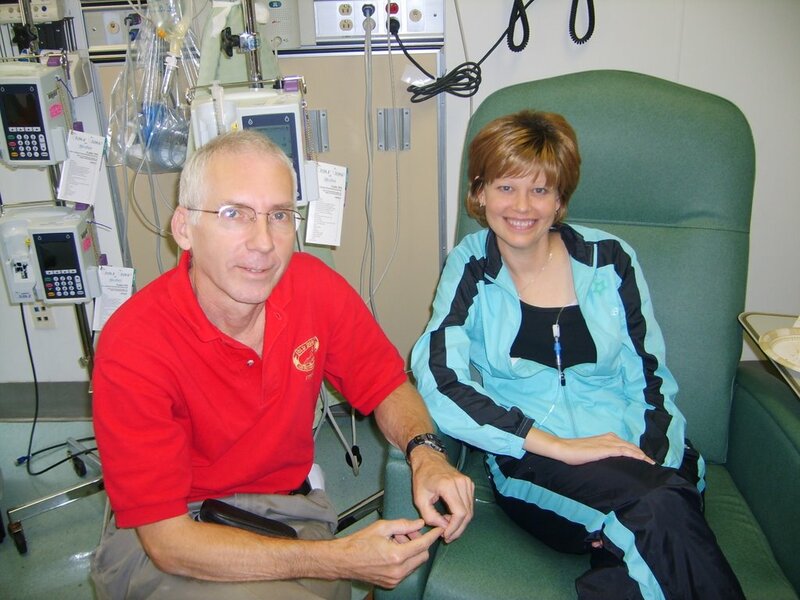 After 29 weeks Karla was finally getting her last infusion of chemotherapy. It was an emotional day for her. On one hand was the happiness of putting this phase of her treatments behind her. On the other hand there was a bit of sadness. 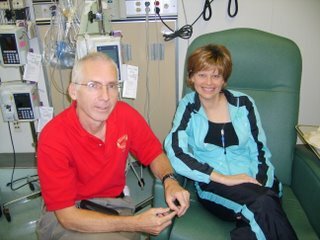 Over all these weeks the wonderful staff at the UNC-Lineberger Comprehensive Cancer Center had taken special care of Karla and close relationships had been formed. Saying good-bye would not be easy. Karla and Frank had invited our friend Jerry and myself to join them in saying good-bye and thanking the staff as well as celebrate the end of this phase of Karla's treatment. It also happened to be Frank's birthday. You can see in the picture the tube inserted in a port in Karla's chest delivering the last infusion. 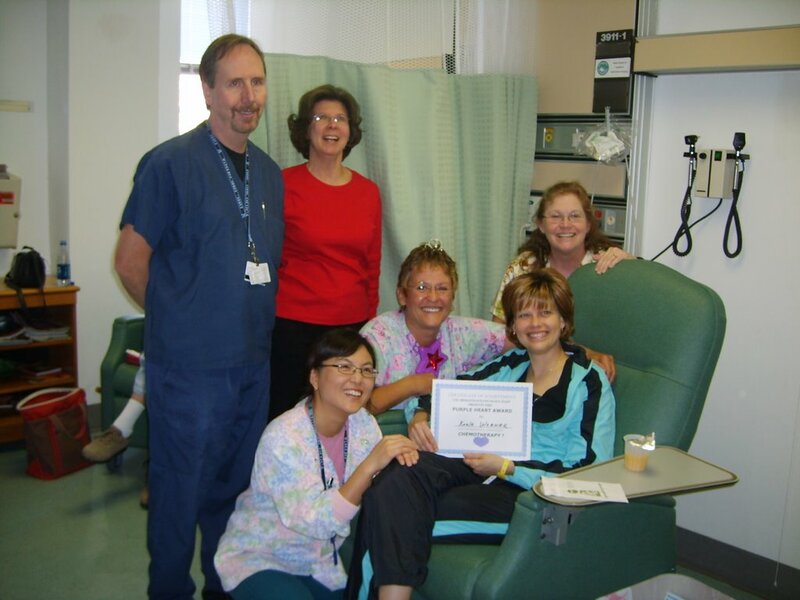 Here are several of the caring staff that have done a great job of treating Karla. Here she is receiving her purple heart certificate for completing all the treatments. They waved the magic wand over her and sang goodbye. The timing worked out great as far as my fundraising in Karla's honor. I let Karla choose which of several cancer charities that she would like for me to use the donations for and it was decided to give it to the Patient and Family Care Center as a thank you. After the infusion was over we went down to their office to make the presentation. 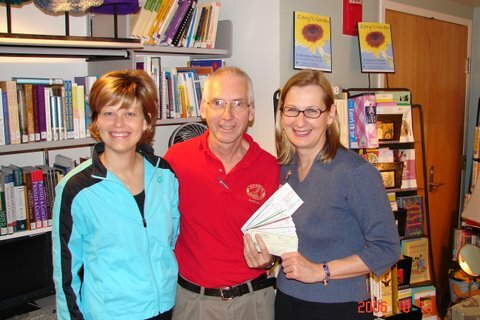 I was very happy to hand over all the checks and cash that was so genorously donated by you, our friends and family. The majority of the money came from the running community which was most appropriate since I raised the money running to honor my training partner and your fellow runner and club member. This is Tina Shaban, the Patient Education Resource Coordinator. Pam Baker, the Program Assistant was also present. Hopefully I can get a picture of her posted soon. Due to your generosity I have now received $1,563.44 to give to them. I want to once again give out a BIG THANK YOU to everyone that made a donation, no matter how large or small. It is very hard for family and friends to watch someone they love battle something like cancer. This was just my way of showing my support for her in the way I know best. Karla's fight against this terrible disease is not over yet. She still faces 6 weeks of radiation before she will be able to put this behind her. In the meantime she remains strong and determined. We just ran the Autism 5K in Raleigh together this morning and she did very well as we were smiling and talking the whole time. This was her best run since we finished Boston back in April. Hopefully on Nov. 12th she will find the strength to finish the Outer Banks Marathon. And I will be there to share the day with her and celebrate life and a special friendship.